Early detection is key for the treatment of heart disease, diabetes, prostate cancer, and many other diseases that disproportionately affect men. However, men are less likely to seek preventative care than women. Despite growing awareness, men usually take a back seat approach to maintaining their health. We will shy away from seeking advice, delaying possible treatment and/or waiting until symptoms become so bad we have no other option but to seek medical attention. To make matters worse, we refuse to participate in the simple and harmless pursuit of undergoing annual screenings. 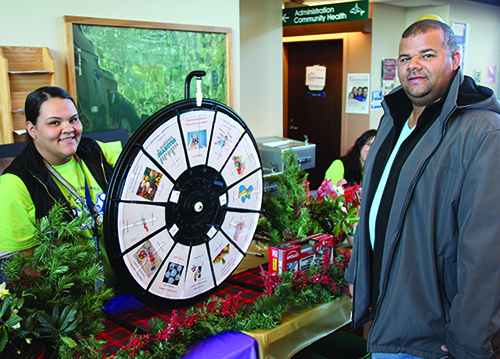 Enter the Annual Men’s Health Fair held at the Karen I. Fryberg Tulalip Health Clinic on Friday, December 16. 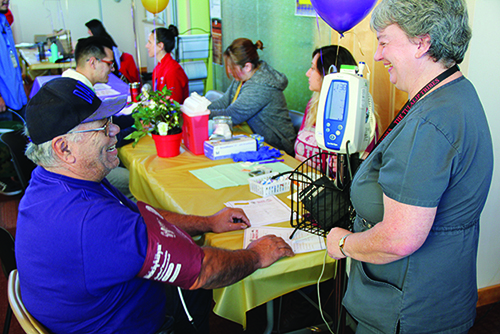 This year’s health fair provided us men the opportunity to become more aware of our own health. With various health screenings being offered for the low, low price of FREE, we were able to get in the driver’s seat and take charge of our own health. Blood sugar, cholesterol, and prostate screenings were among the options for men to participate in. Along with all the preventative health benefits of participating in these screenings, as if that was not reason enough, they gave out numerous goodies and a complimentary “Indian taco” lunch to every man who showed up to take charge of his health. At 16.1 percent, Native Americans have the highest age-adjusted prevalence of diabetes among all U.S. racial and ethnic groups. Also, Native Americans are 2.2 times more likely to have diabetes compared with non-Hispanic whites (per Diabetes.org). Clearly we are at a greater risk when it comes to diabetes, making it all more crucial to have glucose testing and diabetes screenings performed on an annual basis. For those men who attended the health fair, they were able to quickly have their glucose (blood sugar) tested with just a prick of the finger. According to the Centers for Disease Control and Prevention (CDC), heart disease is the first and stroke the sixth leading cause of death among Native Americans. High blood pressure is a precursor to possible heart disease and stroke. High blood pressure is also very easily detected by having routine checks of your blood pressure taken periodically. 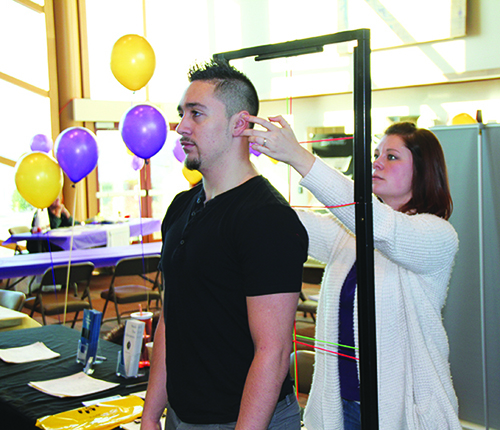 Representatives from Health First Chiropractic, the Marysville branch, were on hand as well to offer a free posture analysis. Using a spinal analysis machine, the patient advocate conducted postural exams on a number of men and reviewed the results with each participant. Good posture can help you exercise more safely and achieve better general health. When you sit or stand correctly, your organs will be better aligned, which reduces indigestion and helps your lungs to function at full capacity. Your core muscles will be strengthened and your back and shoulders will feel more comfortable. Along with the various health screenings being offered there were information booths available that ranged from alternative health care options in the local area, ways to have cleaner air in your home, and methods to change eating habits to live a heathier lifestyle. There was a booth where we could have our grip tested, a method used for assessing joint and muscle fatigue. Another booth offered us the opportunity to have our BMI (body mass index) and body fat percentage measured. Wondered if you need to cut back on those weekend treats? Or if you need to start leading a more active lifestyle? Well if that BMI was too high and you didn’t like what your body fat percentage was, now you know the answer. Face it, as we get older, we all need to become more aware of the inevitable health concerns that may one day affect us. The possibility of having to deal with high cholesterol, high blood pressure, diabetes, or the possibility of prostate cancer looms over us all. The only way to avoid such health concerns to heighten our awareness of these preventable conditions. Health educators empower us to be more proactive about our health by getting annual screenings, detecting issues early, as well as seeking medical treatment before a simple, treatable issue becomes life altering. 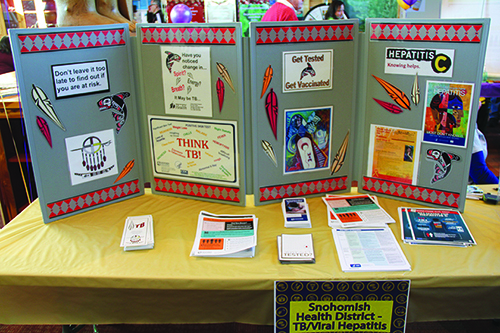 This entry was posted in Health, Local News, Tulalip News and tagged Health, men, Native American by Kim Kalliber. Bookmark the permalink.